When divers get together a talk about Scuba Diving Regulators, sooner or later the Oceanic FDX bomes up in the discussion. The Oceanic FDX 10 first stage regulator is the most advanced first stage on the planet. While this regulator is not the high performance monster like Scuba Pro or Atomic, it is a very close second. In fact Scuba Labs gave it its coveted “Testers Choice” award in 2005. Oceanic like Scuba Pro, makes first stages and second stages as individuals and then matches up the first stage and second stage as sets. Not counting octos or safe seconds, Oceanic makes 7 different types of second stage regulators and 5 types of first stage regulators. When a diver wants to price shop between dive stores, be very careful about which combination they are comparing. Oceanic does this on purpose, now dive stores across the town can have Oceanic, but at different price points from one another. The only way for a consumer to know which is best is to use our comparison chart on the specs on different components. 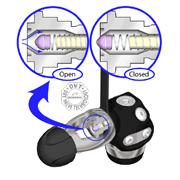 Now, the FDX first stage has an advanced Dry Valve Technology or “DVT” on the FDX regulator. Essentially there is a spring activation device that blocks air and water from getting into the internal air chamber. Water gets in if a diver forgets to place the dust cover back onto the regulator when not in use. While we have not seen a whole lot of water coming into the first stage if cleaning is completed while the regulator is attached to a scuba tank (see our regulator maintenance page), not all divers have an extra scuba cylinder to use for cleaning. The DVT should save on corrosion with internal parts. The FDX can be ordered with a 300 bar DIN attachment and is Nitrox ready, right out of the box. Scuba diving regulators need a first stage and a second stage. To complete this system, the Delta 4 second stage is top of the line with Oceanic. IT is here where some dive shops will order the lesser second stage and not the top of the line. The Delta 4 is light weight (6.7 ounces). 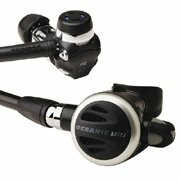 Like most Scuba Diving regulators, the Delta 4 has an adjustable venture system that will assist in moving the second stage diaphragm inwards, thus allows in more air to rush in to the second stage chamber.